To start using RadCheckedListBox just drag it from the toolbox and drop it at the form. Select RadCheckedListBox and click the small arrow on the top right position in order to open the Smart Tag. Edit Items: Opens the ListViewDataItem Collection Editor. Edit Columns: Opens the ListViewDetailColumn Collection Editor. 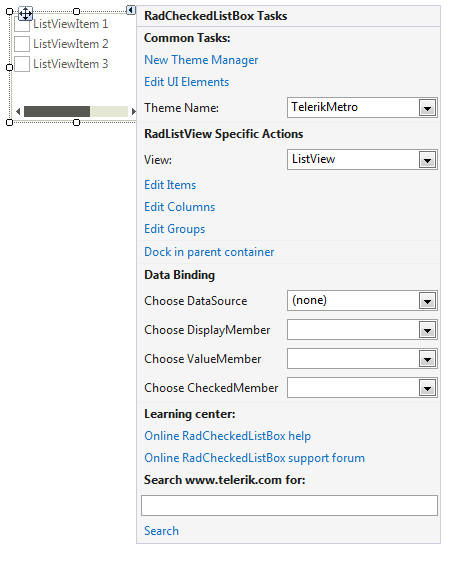 Edit Groups: Opens the ListViewDataItemGroup Collection Editor. Dock in parent container: Docks to the parent container to fill the entire space. Choose DataSource: Specifies the DataSource. Choose DisplayMember: Specifies the DisplayMember. Choose ValueMember: Specifies the ValueMember. Choose CheckedMember: Specifies the CheckedMember.